Alexandria, Egypt, Friday, Feb. 4, 2011. Alexandria the city of popular upheavals for millennia against Roman pagan rule, against Roman christian rule, against French and British imperialists from the landing of Napoleons troops at the beginning of the 19th century to the French and British naval bombardment in 1882 and the Suez War of 1956… at the same time of the rising in Hungary and the Russian invasion. The Egyptians under Nasser where supposedly allies of The Soviet Union in those Cold War days… though Nasser kept local party communist activists neatly in prison. An ancient obelisks from Alexandria, dating back three millennia, symbol of the all powerful rule of Egyptian pharaohs and – in disrespect of any idea of cultural heritage was given away in 1819 by Muhammad Ali Pasha to thank the Brits – enemies of his enemies for their interference against French Napoleonic occupation. Ali Pasha was a Turk general of Albanian origin of the Ottoman empire who had just declared himself ‘Khedive’ (vice-king) of Egypt and Sudan. The obelisk was taken and shipped much later from Alexandria and almost lost on its way and can till this day be seen in London at the embankment of the river Thames. Later the Americans also did get their Egyptian obelisk as a gift by the next Egyptian ruler, Isma’il Pasha, in 1877 – the year of the opening of the Suez Canal – who wanted to play the Americans against the now en encroaching powers of France and Britain. This obelisk also came from Alexandria and now stands in Central Park New York. The French did also get their obelisk from Muhammad Ali Pasha in 1826, this one was taken from a temple in Luxor, it now stands at Place de la Concorde in Paris. In a long range view of history, such symbolic gestures of royal gifts to stem imperial strive make sense. Was the founder of the Bibliotheca Alexandrina not one of the generals of another much earlier imperialist, Alexander The Great? Ptolemaeus (367-283 BC), a Macedonian general, who used the icon of Alexander as a ‘trade mark’ on the coins of his new found Greek kingdom on the soil of Egypt… exploited the split up spoils of Alexanders wars of aggression against other empires, founding yet another one. He named himself pharaoh and was also the founder of the most idealised icon of all libraries the ‘Museon’ with in it a collection of mainly book-scrolls, later known as ‘The Bibliotheca Alexandrina’. The new dynasty was expanding over neighbouring countries and held out three centuries to end up as a Roman dependency. Alexandria has been a most important hub in Mediterranean trade, not only of goods but also a centre where different believe systems both came together and were fighting each other. Pagans versus Christians and different schools of Christians between each other , while over time Islam took over almost completely and Jewish influence was constant, but marginal. The history of rulers and upheavals in the town of Alexandria is sheer endless. These associations made me find today a fascinating book on the history of this town by Christopher Haas “Alexandria in late antiquity: topography and social conflict”, with several opening chapters freely available on the internet by GoogleBooks. “The true criminals are the blood suckers… that sucked us dry”, Colonel Nasser is shouting from a balcony in Alexandria just over half a century ago… and I remember the war and the inflamed news of the Cold War on the radio, from when I was just a boy of 12 years old. The bloodsuckers where the French entrepreneurs that started the construction of the Suez canal and the Brits that were first opposing this new shipping route – because they had insufficient control of it – but later took over control and endorsed it. Main part of the work was based on Egyptian slave labour (“Egyptian blood ran in the canal before the water of the seas”). Nasser and his rebellious group of young army officers confiscated the Suez Canal in 1956 and send a wave of popular enthusiasm not only through the whole of Egypt, but throughout all of the Arab world. That attempts at canal building and the inclusive slave labour to realize it goes back till the time of the Egyptian pharaohs was left out of the revolutionary rhetorics of that time. Has Egypt now been colonised by its own ruling class? 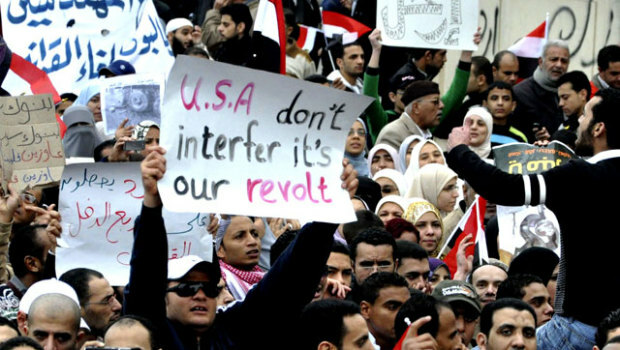 Or is it only a neo-colonialist conspiracy with Mubarak as a puppet? The last option seems to be the most unreal one… So who are the true criminals now? It seems that in the end each nation that has freed itself from the shackles of colonialism and even neo-colonialism, has enough exploitive creativity within its own ranks to keep on or recreate whatever forms of group exploitation. What we see is the demise of romantic ‘Third Worldism’, packaged in marxist, leninist, maoist or any other anti-imperialist discourse. The ‘haves’ and ‘have-nots’ may on the level of Gross National products economically by separate areas of the world, but within each territory this two-fold separation is reproduced once again. Each name of a leader we may know or learn during upheavals like the one in Egypt, is like a bastions behind which whole social layers of society who are profiteers and practitioners, hide themselves. The personal power of the Egyptian presidency from Nasser To Sadat en Mubarak may be comparatively speaking huge, a ruler and his or her rule is always carried by several layers of society, kept in a bond of reciprocal dependency. Is being wealthy always a crime and poorness a virtue? Or can there be some form of creative connection between the classes to level out their differences, because too much wealth can not be consumed alone and needs to be shared. Is that maybe what democracy in Egypt and elsewhere should be about?